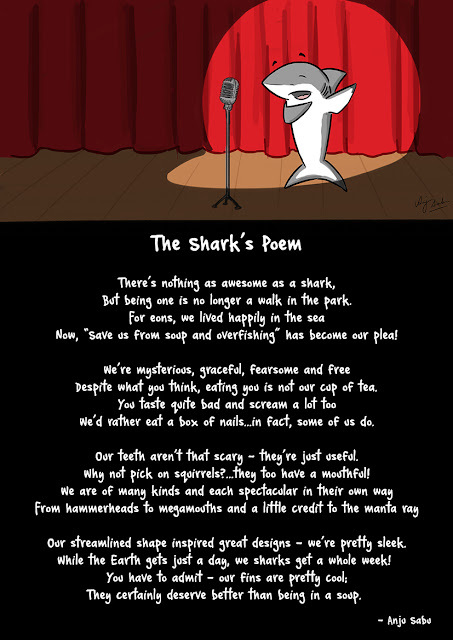 A slightly modified version of my Shark poem. It somewhat captures what a shark is and what we have done to the species. We need our oceans, our oceans need sharks, ergo we need sharks. We don't need shark fin soup as much as we need oceans. Hopefully we will see an increase in intelligence in this matter in this generation. Sharks are usually the main attraction in aquariums. Watching them makes life better even if just for the moment. They're on almost all kids' apparel brands these days (mostly on boys' but girls love sharks as much if not more). Don't let sharks die out.